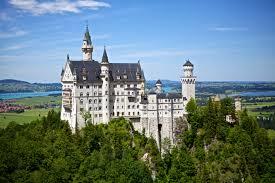 A trip to Neuschwanstein Castle from Munich will take one day. You have to walk up the hill and at least I did not see any cable car etc. So if you are traveling with babies on the pram, do check the latest facilities before you go. Work on Neuschwanstein (Fairytale castle) began in 1869. It is situated near Schwangau in Ostallgäu. It along with Herrenchiemsee and Linderhof palaces architecturally caused a great stir. King Ludwig II. of Bayern, who died before the fairy tale palace was completed, ordered Neuschwanstein to be built high on a cliff over the Pöllatschlucht near the town of Füssen. With its towers and turrets, the palace looks like a castle from the Middle Ages at the time of the crusades. Inside, the palace was decorated with motives and scenes from Ludwig’s favorite composer, Richard Wagner. The winter garden and the stalactite cave are based on Tannhäuser, the Byzantine throne room on Lohengrin and the minstrel’s hall on Parsival.